Bop bada baaa! Bada ba bapa baaaa! The onboarding email tear downs that you’ve been waiting for are finally here. Look, I know you’re a Very Busy Person and honestly haven’t thought twice about when you’ll see an onboarding tear down next. But I’ve been chomping at the bit to share this one with you so let’s dive right in, shall we? Let me start by saying that Freckle is doing a very  good  job  with their onboarding emails. Company founder, Amy Hoy, knows a thing or two (or 500) about marketing and growing a business. She’s a killer writer, a witty educator, and while you were gulping down your kale smoothie earlier Amy was probably busy building and launching at least three other businesses. Like many brands, Amy and her team likely setup some system-triggered emails as an onboarding MVP (minimum viable product) when they built Freckle. 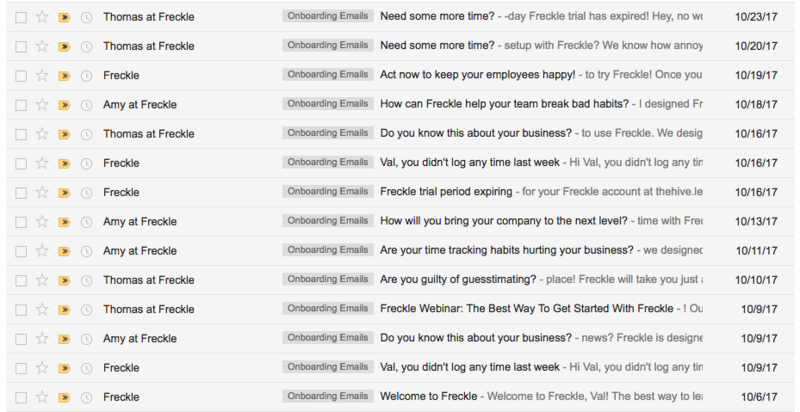 Then they had some breathing room once the thing soft-launched so they built out a proper series of onboarding emails. Then they added an education piece (that webinar) and plugged it into the mix. This onboarding sequence is chock full of good intentions (and even better writing) with just a few improvements and considerations that you can learn from. We’re easing into this series, k? Now let’s open up that inbox and see what we’re cooking with! Look, if you don’t have a simple welcome email setup for your new customers or email subscribers, go do that right now. I mean, don’t even read the rest of this. Just go directly to your ESP and write a welcome email. Just imagine someone walking in your house and you never say a word to them. Yeah, so is not having a welcome email. 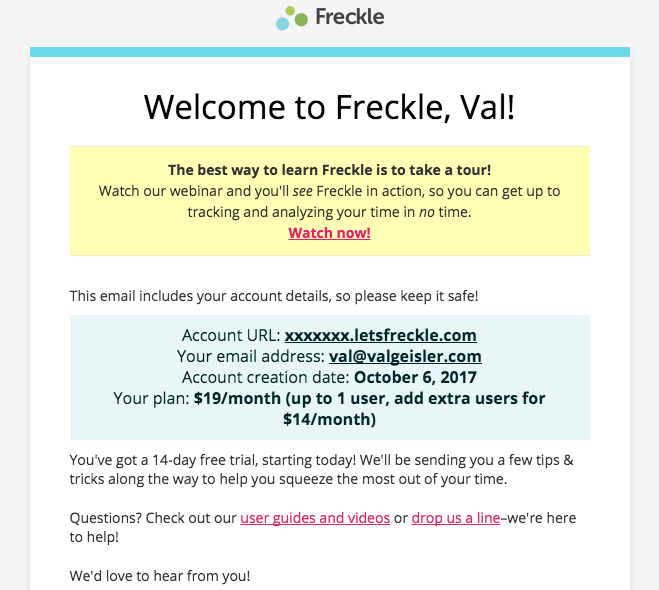 Freckle does a great job of welcoming me as a new (not-yet-paying) customer here and, since they’re an app I’ve signed up to trial, they’re giving me my account info. This email has a lot of info so I probably miss some of those calls to action. Hopefully they’ll remind me of those action items later on down the road. Aaaaaand since I’m busy/lazy I sign up for my free trial and immediately don’t use it at all. 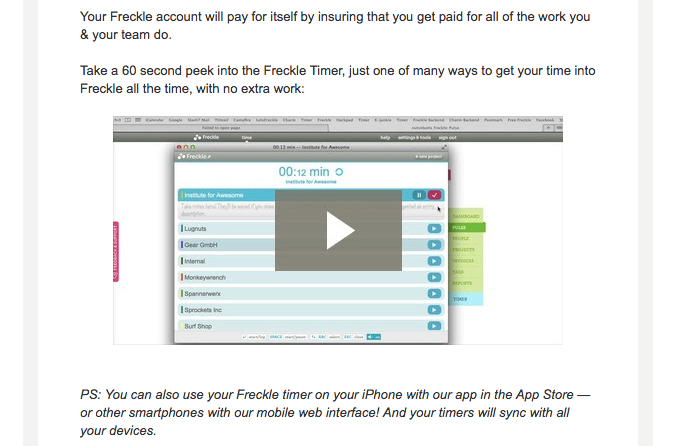 I get 3 emails from Freckle! This is where the multi-setup systems aren’t talking to each other. Email #1: The system is telling me I did nothing with my time tracking (the whole purpose of Freckle) in the last week. For reference, I signed up on a Friday (10/6/17) and this system-sent email seems to send every Monday. Awesome for retention purposes, only kinda awesome for onboarding purposes. Because the vast majority of your newly onboarded customers won’t use your app in those first few days. They got a link to your product from a friend who was all “Yo, check this out and get a free trial!” and then they signed up realquick before hopping on a client call and then they promised to set it all up that weekend but then they forgot that their old college roommate was visiting and now it’s Monday and here we are. So if one of your first emails is all “is this thing on?” it can backfire a bit and be a turn off. I didn’t do anything so the system let me know it. Email #2: Here’s an email from Amy, the founder. Sweet! Oh, and it’s full of educational content! Even better. This is truly my first onboarding email that’s giving me something I didn’t know I wanted. I can’t imagine life without this email now. I didn’t know I wanted it but now I want more. Amy even signs it off like we’re in this together (and she throws her street cred around a bit there too). “Yes, Amy! Let’s log it!” I say. 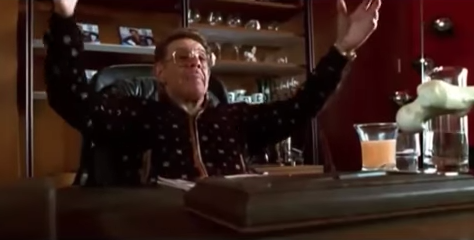 Email #3: Okaaaaaay. 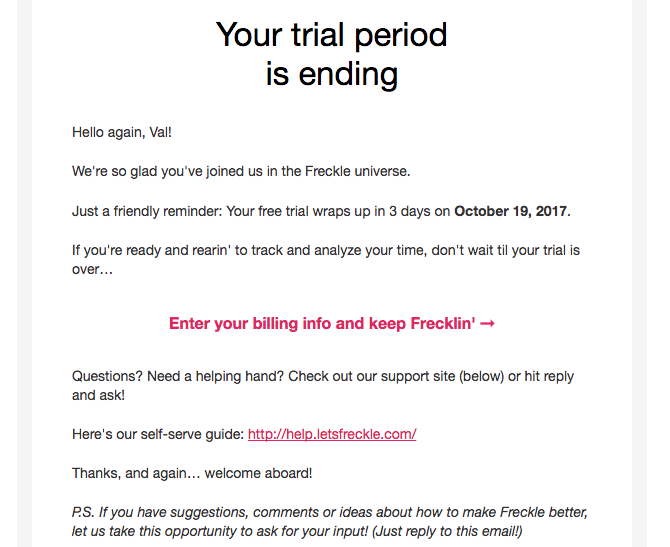 A third email from Freckle today? Coming on strong, new friends. This is where the two hands might not be talking to one another. Thomas (there’s two Thomas’ at Freckle, btw) sends me an email about a webinar. If you remember from our original welcome email, there was mention of a webinar there so I’m glad to see it’s getting it’s own email. It’s short and sweet (and I’m thankful for that since I’m getting email fatigue here on Day 3). The next day I get another email from Thomas (hey buddy) that’s a bit longer, more educational, and includes another invite to that webinar. I get an email from Amy. But this email feels really…. familiar. Thomas asked me the same question yesterday! In the subject line, even! So I breeze over this email from Amy, even though it has a really useful 60 second video I should really watch. The next 3 emails from Amy and Thomas are crucial and they’re typically where other brands don’t deliver. 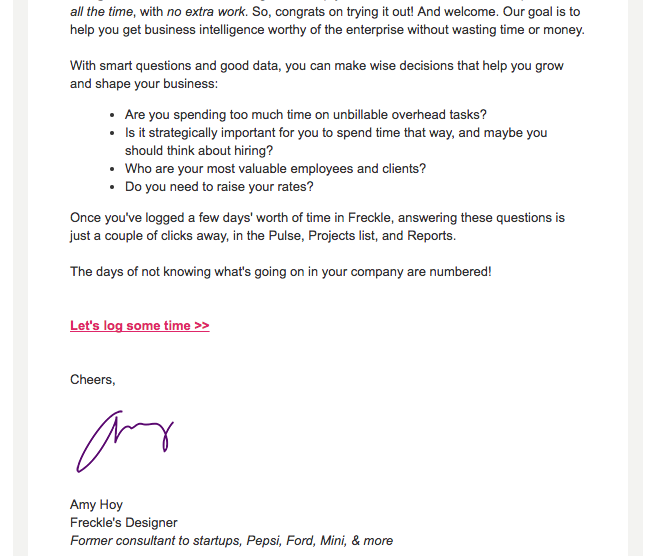 On Day 7, Day 10, and Day 12 of my onboarding experience, Amy or Thomas is in my inbox sharing a little piece of Freckle they think I might really appreciate. In addition to that, the system is also reminding me how much time I’m logging (at this point I’d probably be using Freckle if I were into it so introducing these usage-based emails over a week into the trial makes sense here). Three emails in one day again. Sure, there’s some magical math about signing up on a Friday and the usage-based emails happening on a Monday but I’m not a mathematician, Janet. I’m just an email marketer and a consumer who knows that two is just about the maximum number of emails in one day that a person can handle from a brand, okay? Three emails are cool if I clicked on a link showing interest in that thing you’re selling during your launch. The day has come and my 14-day free trial has ended. Luckily for me, the emails don’t. And then I get two follow up emails from my pal Thomas offering to extend my trial and basically commiserating that OMGLIFEISSOBUSYHOWCANIHELP. At this point, I’m magically dissolved into the main Freckle email list and continue to get…. 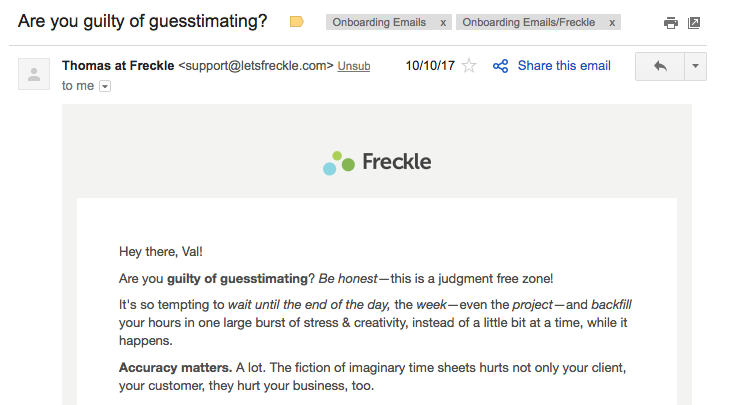 Look, I searched and searched my inbox for more emails from the Freckle team and never saw another once since this one. MAYBE THE ZOMBIES GOT THEM. All I know is that really great onboarding doesn’t stop at the end of a free trial. By continuing to stay in touch with that customer who never converted, you get to stay top-of-mind so that when they eventually do need your service, you’re the first one in your niche that they think about. Let’s put a bow on this package, shall we? 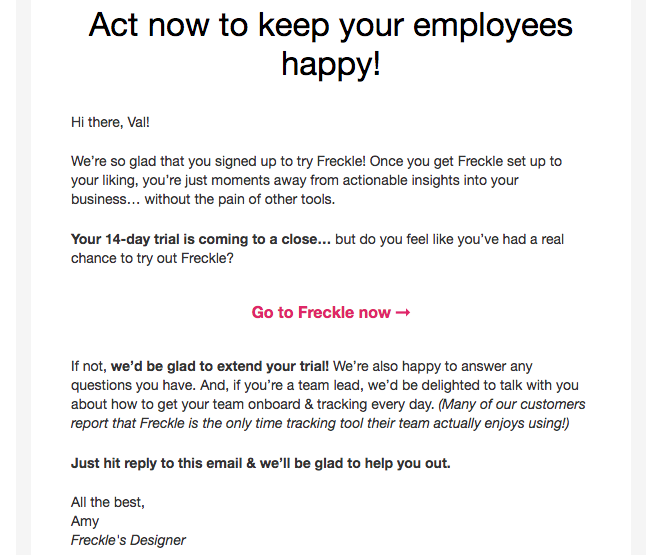 Of course, there’s a ton of opportunity for Freckle to do a win-back sequence or a churned-customer survey or any retention-based emails after the trial period ended. Onboarding a new customer doesn’t end at the end of their trial (even if they never convert to a paying account!). Onboarding is an ongoing process that works best with frequent communication up front, ongoing emails long term, and specialized emails down the road that show them you care more than that first date. 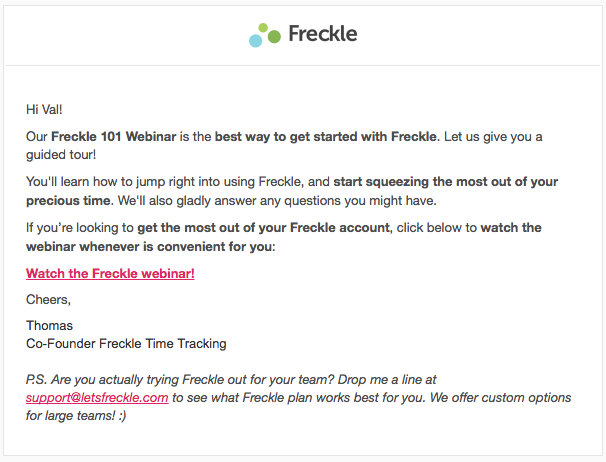 What are your biggest takeaways from Freckle’s onboarding emails? How will you apply those lessons to your business? Have a set of emails you want to see dissected here? Send me a note at heygirl(at)valgeisler(dot)com with the details of where I can sign up! If I write up the review, I’ll share a draft with you before anyone else sees it.